Open concept living: open floor plans continue to be popular among home buyers who prefer the clear sightlines the combined great rooms offer, which better support the way we entertain. More living space instead of bedroom space: more buyers are willing to trade a larger bedroom for larger living areas. There’s been more emphasis on in-home entertaining and having an larger communal living space is top on those buyers’ lists. Color is edging out all-white kitchens: after nearly a decade at the top, all-white kitchens are slowly being usurped. More buyers are looking to warm up their kitchens by adding a bit of color, whether it’s through natural wood cabinets, colored islands (talk about statement piece) or paint. Specialty/Hobby rooms are the new bonus rooms: buyers still want bonus rooms, but instead of having a non-descript extra space, they want to create spaces that speak to their lifestyles. Think yoga rooms and craft spaces to name just a few options. Designated home office: a dedicated home office is still tops buyers’ lists. Even though today’s wireless technology means people can work anywhere, people want to be able to work in a devoted area instead of working on the couch or from the kitchen table. Energy efficient features: energy efficient appliances and building features are still very desirable. These features not only help the environment but also help keep their homes more comfortable while using less resources, saving buyers on monthly utility bills. Personalization is important: buyers want to be able to put a personal stamp on their homes, often choosing a builder that offers more of the design options they’re looking for. 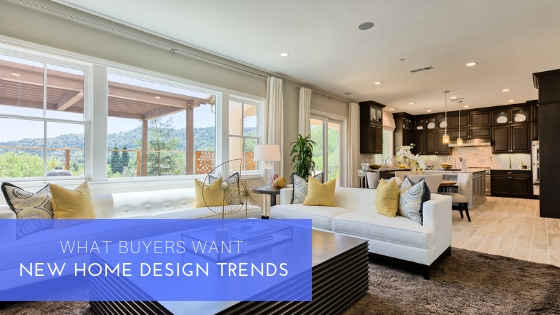 Which of these design trends do you most want in your new home? SummerHill Homes is dedicated to designing and building communities of distinction, with quality single-family homes, condominiums, and townhomes in the most sought-after neighborhoods in the Bay Area. Visit SummerHillHomes.com to learn more about our vibrant communities and homes today.